AMBOSS, a breakthrough medical study platform, today introduced its comprehensive test preparation and in-depth study tools for NBME® Subject Examinations (e.g., Shelf Exams) and USMLE™ Step 2 CK. 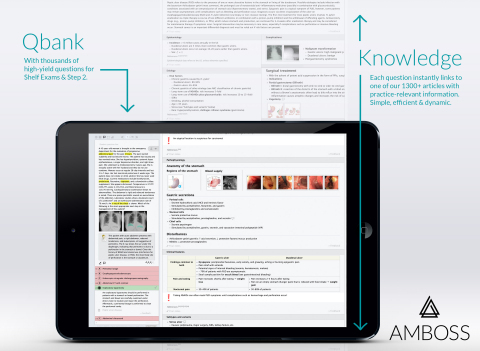 More than 200,000 medical students and physicians worldwide rely on the AMBOSS platform for test preparation, in-depth studying, and as a clinical companion. AMBOSS is the only digital resource that includes more than 2,000 exam questions that are integrated with 15,000+ medical library topics. Specific Shelf Exam preparation is available for medicine, surgery, pediatrics, clinical neurology, obstetrics and gynecology, and psychiatry rotations. Over 40 percent of students in the clinical years from the top five U.S. medical schools have already accessed AMBOSS, early success built on the foundation the platform has in Europe. AMBOSS introduced its first medical education resources in Germany in 2011, and today more than 95 percent of German medical students use the software as a clinical reference and for final examination prep. More than two-thirds of medical universities in Germany and Switzerland license AMBOSS for their students. Enhanced, Definitive Qbank. The question bank (Qbank), with exam-style multiple-choice questions, is fully integrated with the interactive Knowledge Library to instantly provide training-relevant information. AMBOSS encourages students to find the right answer independently by offering didactic clues, teaching them how to better solve challenging test questions. Functions, such as “Study Mode” or “Exam Simulation Mode,” enable students to experience a fully interactive learning environment or test themselves in exam-like conditions, respectively. Interactive Knowledge Library. The AMBOSS digital Knowledge Library contains thousands of articles with practice-relevant information that users can access anytime, anywhere (including offline-capable apps). When students are reading about a topic they can transfer to a related subject or term by using the linked keywords. The Library’s cross-specialty focus ensures that students will acquire medical knowledge that will stay with them throughout their careers. Library information and the Qbank are rigorously cross-checked by a team of more than 50 physicians to ensure the material is up-to-date, clear and comprehensive. Personalized Study Analysis. As a user moves through the Qbank and Library, AMBOSS analyzes his/her knowledge level and provides personalized statistics and recommendations on what to focus on to close knowledge gaps and learn efficiently. Visual Learning. AMBOSS presents medical content visually through interactive multimedia, such as annotated tables and flowcharts, anatomical illustrations, a virtual microscope, videos, library quizzes, and radiology images with overlays. A unique video mini-lecture series titled, “Chalk Talk,” is in the platform. Students can purchase AMBOSS Plus for only $48/month or $365/year. Register for a five-day free trial at www.amboss.com. AMBOSS representatives will be visiting medical schools around the U.S. this fall. To learn more, contact media@amboss.com. AMBOSS has already transformed medical education in Europe, and is introducing a new era of learning in the United States by advancing the way medical professionals acquire and build their knowledge. Founded in 2010, the company has offices in New York City, Cologne, and Berlin, and comprises professionals in the fields of medicine, didactics, digital learning, medical illustration, and software development — all of whom contribute remarkable attention to detail. AMBOSS’s innovative learning and reference program has already contributed significantly to improving the everyday lives of prospective physicians. More than 200,000 doctors and students now use AMBOSS for their studies and their professional routines — a number that is rising on a daily basis. You can find out why at www.amboss.com. Follow us on Facebook, Instagram, and YouTube. AMBOSS today introduced its test preparation and in-depth study tools for NBME® Subject Examinations (e.g., Shelf Exams) and USMLE™ Step 2 CK.